A front-row seat watching chef Fran Agudo at Tickets. All photos by Shari Bayer. It takes courage to dine alone. To tour kitchens, chat up chefs, and snap stunning photos of once-in-a-lifetime meals at the world's best restaurants. 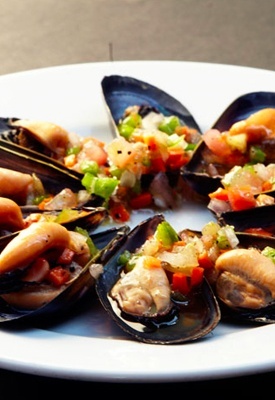 And that's exactly what Shari Bayer did on a gastronomic tour de force in Spain. 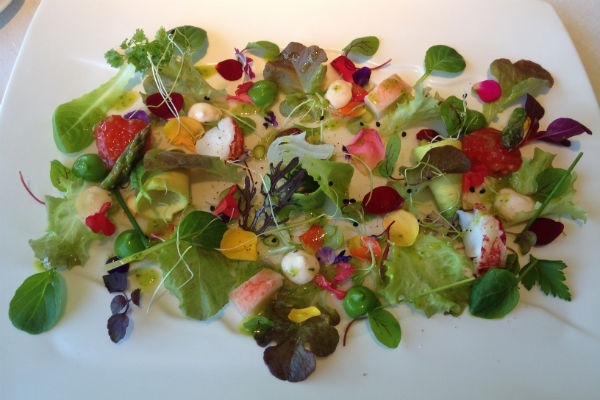 SPAIN – I spent a gazillion dollars dining by myself in Spain. Okay, maybe I didn't spend THAT much, but it was a lot. And it was fabulous and worth every penny. 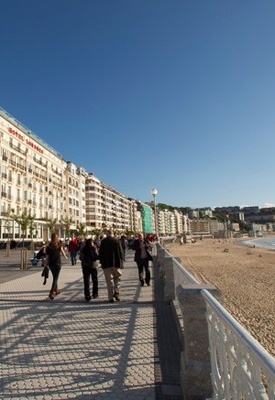 As a restaurant publicist, I travel for food, and San Sebastián ("Donostia" in local Basque parlance) has been high on my destination list for some time. Only rather than wait for a friend or guy to venture to Spain with, I decided to go on another solo travel adventure. To prove how serious I am about food, I made two of the restaurant reservations before I even booked my flights or hotels. Although traveling to Europe in November is a bit off-season, I didn't want to risk it. There would be a table for one waiting for me. That's what the oldest restaurant in Spain looks like. Then I flew to Bilbao, where I rented a car to drive to San Sebastián, first making a pit stop at Museo Guggenheim Bilbao. I arrived in San Sebastián at sunset and saw that the Basque city on the Bay of La Concha was as beautiful as I had imagined. Before I began my fine dining marathon, I met up with my friend Kevin Patricio, who lives in San Sebastián, for a night of pintxos hopping. What a treat! From pig's ears to sardines, we shared the region's most delicious delicacies at budget-friendly prices. Thanks, Kevin! It was time for the marathon to begin. Four days. Six restaurants. Thirteen Michelin stars. 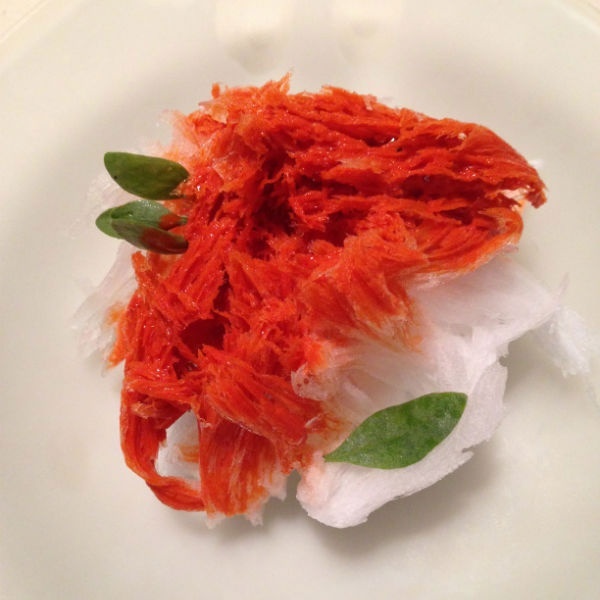 This is what ice shreds and scarlet shrimp perfume looks like. 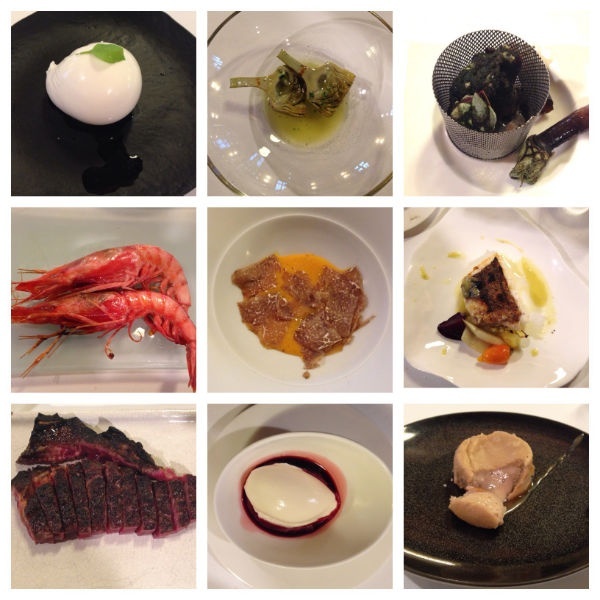 Highlights from the tasting menu at Mugaritz. The GPS directions took me down a dark, windy road to chef Andoni Luis Aduriz's three-Michelin-star Mugaritz, currently rated #6 on San Pellegrino's The World's 50 Best Restaurants. When I arrived, I was escorted to a quaint lounge in a separate building for a cocktail. I was so excited to be there. After I was seated for dinner, I was offered a kitchen tour, where I chatted with the chef de cuisine. The kitchen was as gorgeous as I had anticipated, almost in contrast with the understated and minimalist dining room, where only half the space was used for service. 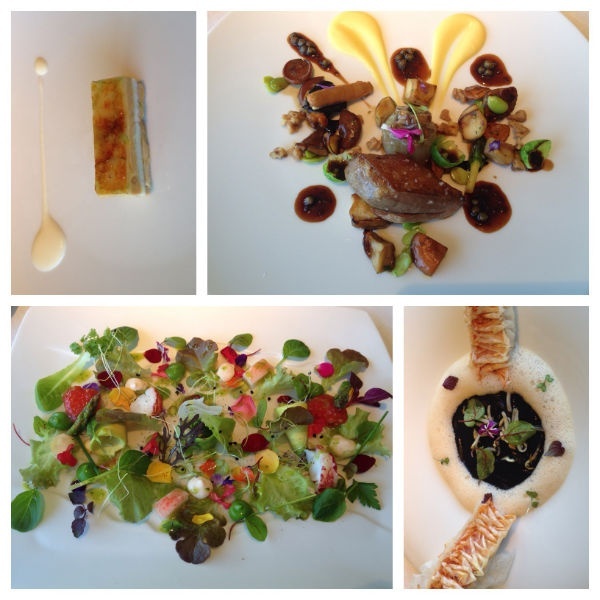 Clean-looking creations from the tasting menu at Restaurante Martin Berasategui. 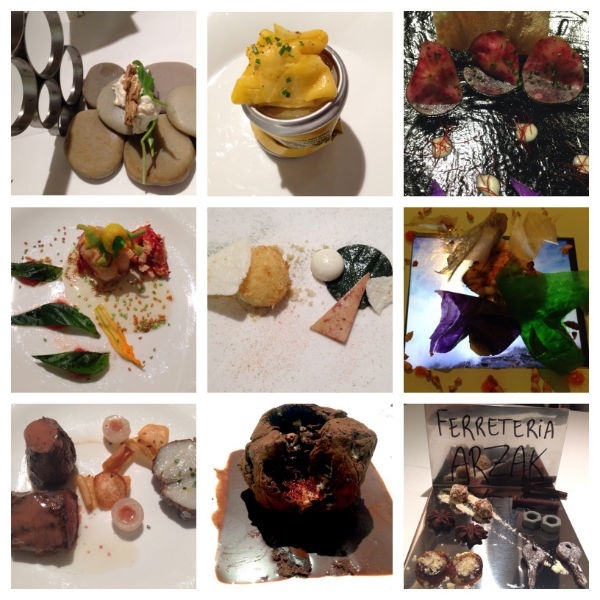 The next day, I made my way to Restaurante Martín Berasategui (three Michelin stars; #35 on San Pellegrino's list). I arrived at 1 p.m., an hour that is early for Spaniards, and was the only one in the dining room. The space is serene and overlooks rolling green hills. I felt like I was eating in someone's elegant home. This made sense when I learned that chef Berasategui lives upstairs. I was especially eager to dine here because a former client, a very talented chef, had worked for Berasategui many years ago. My anticipation was rewarded: Lunch was phenomenal. My server guided me through the menu, which listed the year each dish was created, and he designed a small tasting menu that began with a beautiful vegetable hearts salad (2001), followed by roast red mullet with crystals of edible scales (2013), and roasted pigeon with Iberian pig's snout (2013.) Dessert was vanilla apple pie (1995) — fitting, since it was Thanksgiving Day. My attentive server gave me a kitchen tour and brought me a copy of Le Grandes Tables Du Monde, a book featuring the best gourmet restaurants in the world. It was a gift of kindness for a solo diner. Looks from the tasting menu at Restaurante Arzak. There was no snacking before dinner, as next up was Restaurante Arzak famous seat of chef Juan Mari Arzak and his daughter Elena (three Michelin stars; #8 in the world). From my seat at a corner table in the modest dining room, I could watch the room and the charming Juan Mari as he greeted every table, making every guest feel so welcome. The staff was warm and friendly, and the tasting menu was — wow! I was particularly fascinated by fish steak with potatoes served over a tablet video screen of ocean waves with sound. A memorable meal and innovative meal topped off with a two-part dessert finale: The super truffle — cocoa and sugar that melted with the addition of chocolate liquid — and Ferreteria Arzak, aka the chocolate toolbox. The kind maître d', who previously worked in NYC, showed me around the kitchen before I left. High caliber food in a low key farmhouse. 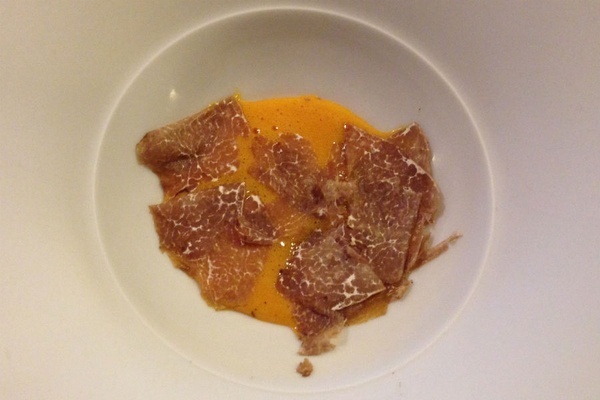 Decadent white truffle scrambled eggs. 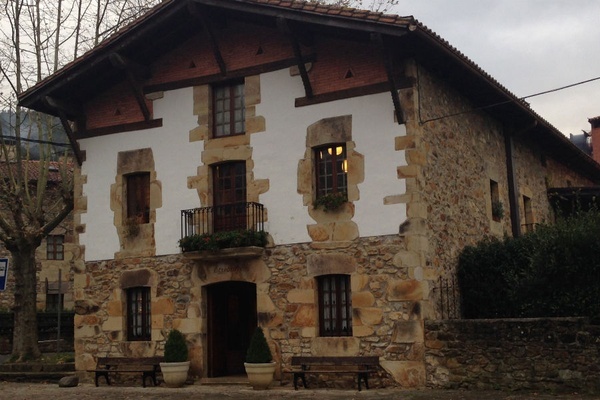 Day three was a road trip to the countryside, destination Asador Etxebarri (one Michelin star, #34). About an hour from San Sebastián, the restored farmhouse in Atxondo is worth the trip just for the setting. Chef Victor Arguinzoniz offers a la carte and tasting menus of his wood-fired cooking, and I opted for the latter. It was wonderful, if a bit too much food for me. (The beef chop did me in.) Nevertheless, the burrata, artichoke, prawns, scrambled eggs with white truffle, and reduced milk ice cream were delectable. 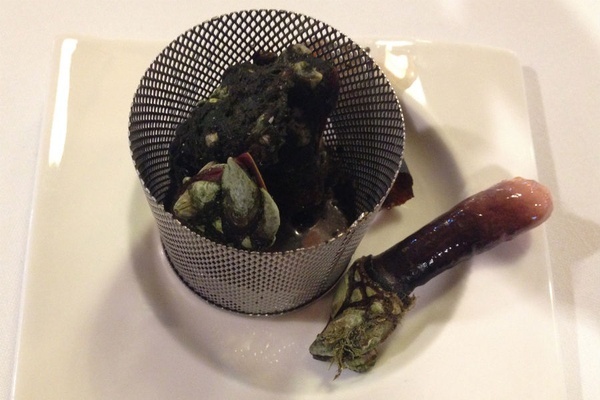 The messy goose barnacles were unforgettable, though not exactly my thing. Woah. Distilled lobster cooked in a coffee vacuum siphon. On my last night in San Sebastián, the plan was to go casual. 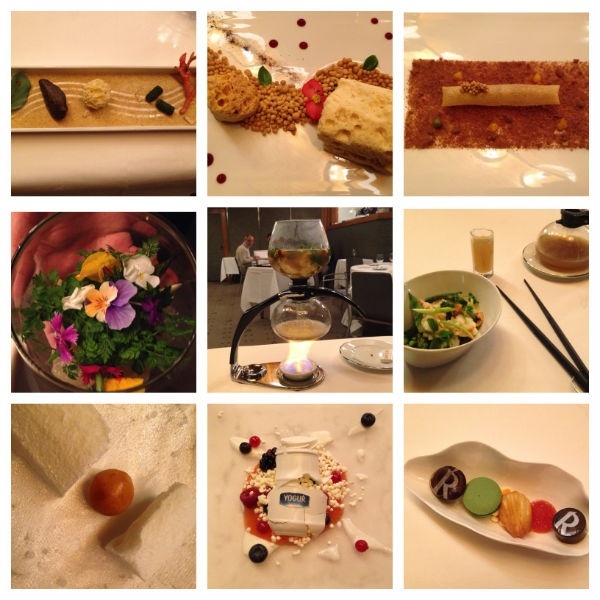 Until a tweet from restaurant reviewer Steve Cuozzo persuaded me not to miss three-Michelin-star Akelaŕe. I should have gone during the day for the gorgeous bay view, but with limited time, it was dinner for me. Chef Pedro Subijana serves three different tasting menus of his new Basque cuisines, as well as a la carte, the option I picked. 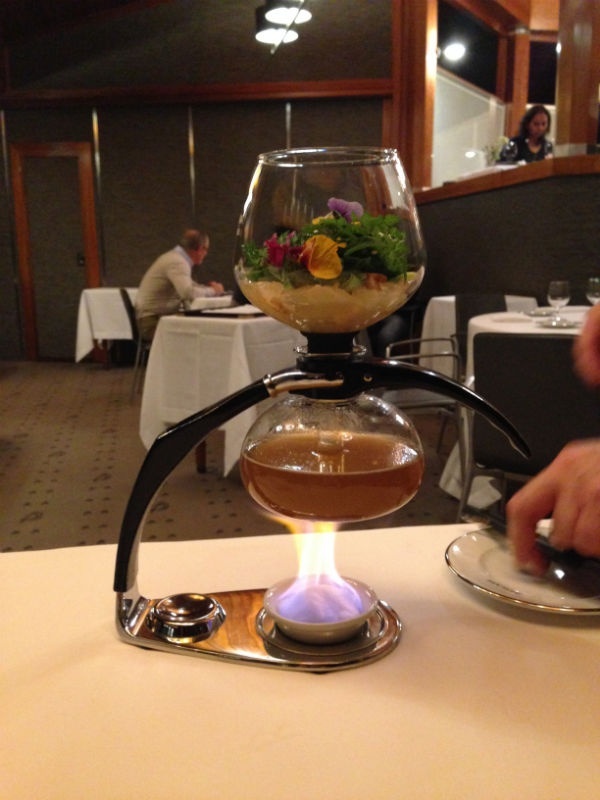 Langosta destilada (distilled lobster) was cooked table-side in a coffee vacuum siphon. It was almost as wonderful to watch as the daytime view would have been (almost!). 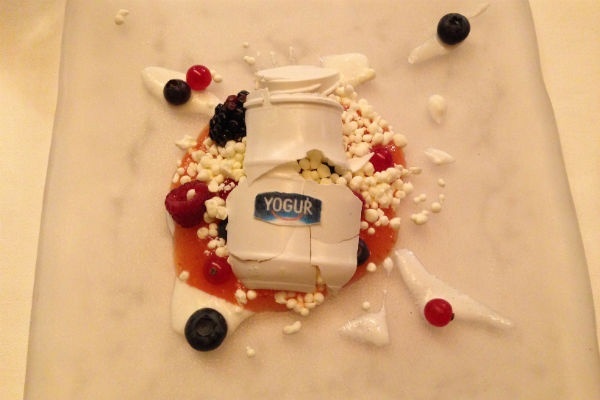 The broken jar of yogurt dessert was also a cool showcase of molecular gastronomy. I was glad to experience it. 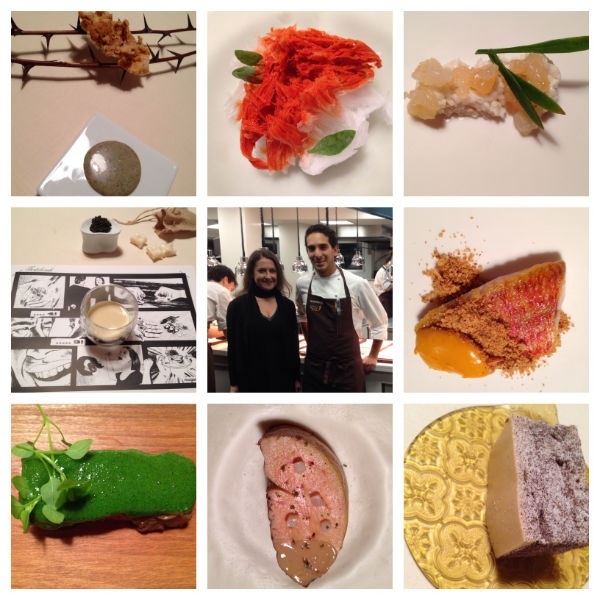 Highlights from the tasting menu at Tickets. 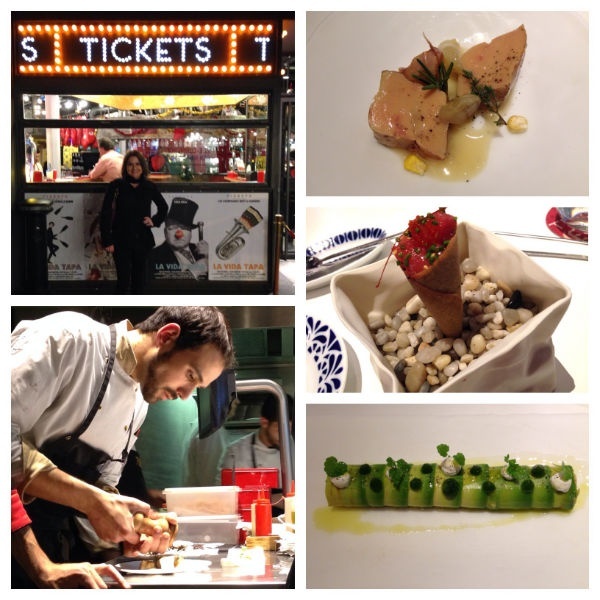 The next morning, I flew to Barcelona, and that evening, I had one more, mind-blowing tasting menu at Albert Adria's innovative tapas bar, Tickets (one star; #57). An industry friend who lives in Barcelona made the reservation for me (I had made all the other reservations), and I had the best seat in the house in front of the chef's pass. I was enamored watching the cooks work and the plates fly through the window. There was high energy and incredible innovation happening. I loved how my server created a customized tasting menu for me. Oyster. Spherical olive. Foie gras. Tuna cone. Iberian ham. Edible cupcake (shell included). And more. Simply amazing! For the remaining few days of my trip, I dined more casually at some of Barcelona's best neighborhood places, like Pinotxo Bar at Mercat de Sant Joseph, La Pepita, and Suculent. It was a sensational solo trip. Gracias, España. These are the hotels Shari stayed in and saw on her adventure, and the other restaurants she visited along the way. Elegant, grand hotel in a 19th-century building overlooking San Sebastián's seafront promenade and La Concha Bay. Good-value hotel in the city center. Modern, boutique hotel centrally located in the Gothic Quarter. Recently renovated hotel in a restored 18th-century townhouse located in the Las Letras district. Spanish tapas bar in the Boqueria market that is always crowded and a crowd-pleaser. Small and cozy old wine house in Raval serving traditional Spanish cuisine prepared using modern techniques. The cafe that's deservedly famous for its hot chocolate and churros. At all hours of the day and night. Traditional tapas in a modern setting in Palacio de Tepa hotel. The popular "House of Grandfather" standing-only tapas bar serves a limited menu, including gambas al ajillo. Amazing modern marketplace with a large variety of vendors selling Spanish delicacies and tapas. 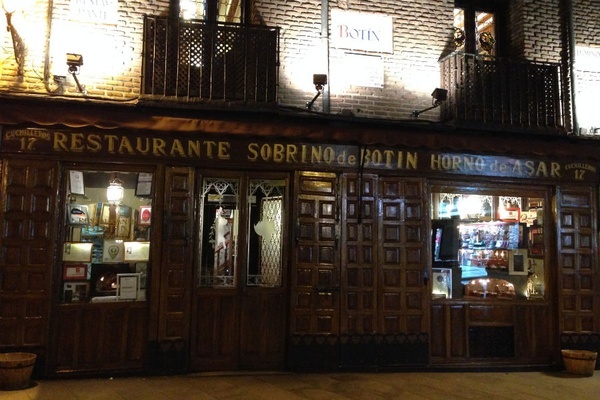 The oldest traditional Spanish restaurant in Spain, founded in 1725. Known for its roast suckling pig. 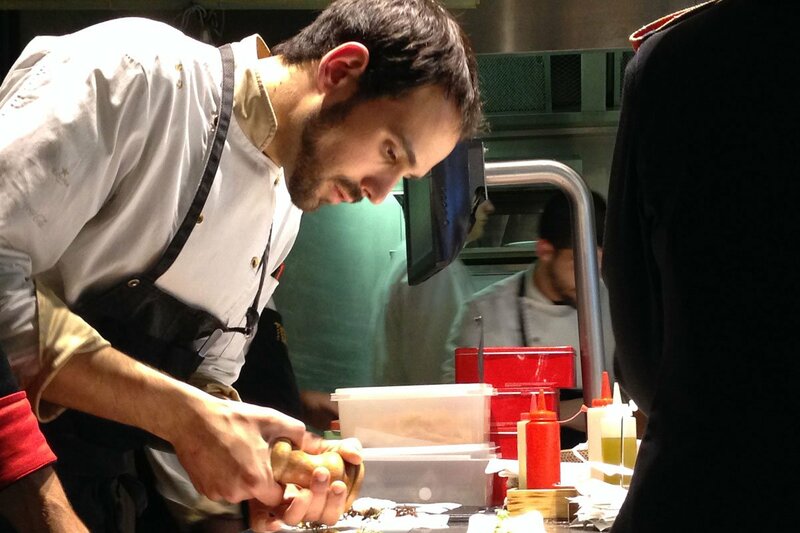 Inset photos: Courtesy of Hotel de Londres y de Inglaterra; courtesy of Pinotxo Bar.